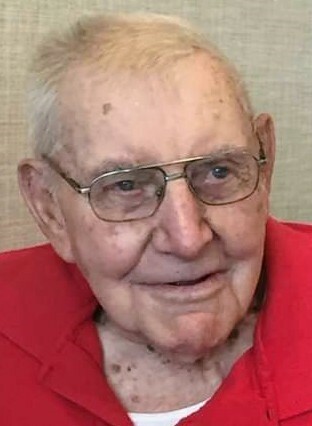 Obituary for John Kenneth Russell | McCoy-Moore Funeral Home Inc.
John Kenneth Russell, 97, Bidwell, Ohio passed away Tuesday, December 4, 2018 at his residence. Son of Paul D. and Sarah J. (Rathburn) Russell, he was born May 12, 1921 in Morgan Township, Gallia County, Ohio. John quit school early to run the family farm and was called to serve our country September 1, 1942 by the Air Force – he was then moved to the 3rd Army 80th Division. During World War II on February 7, 1945, he was seriously wounded with shrapnel while in Germany. He then returned home to the United States May 7, 1945 and was discharged with the Purple Heart and other Medals June 19, 1945. He married Helen Maxine Knight March 12, 1949, who preceded him in death March 4, 2008. To this union was born a son, Johnnie Eugene Russell, who also preceded him in death December 19, 2012. John Kenneth retired from the State Highway Department in 1985. He was also a school bus driver for Gallia County Schools for 18 years and ran a grader for Morgan Township for 7 years. John worked many summers for the County during his lifetime. He is survived by two granddaughters: Tina M. (Dennis Foley) Russell and Melissa (Andrew) Blank; great-grandchildren: Andrew John "A.J." Blank, Isabella Dawn-Marie Foley and Rori Jo Foley; daughter-in-law, Carol Russell and nephew, Paul (Caroline) Brown. John Kenneth was the last Russell in the family. In addition to his parents, wife and son, he was preceded in death by two sisters, Virginia Russell Brown and Pauline Russell Bush and brother, Merle Russell. Funeral services will be conducted 11:00 AM Monday, December 10, 2018 in the McCoy-Moore Funeral Home, Vinton Chapel, with Rev. Heath Jenkins officiating. Full Military Graveside Rites will be performed in the Vinton Memorial Park, Vinton, Ohio by the Vinton American Legion Post #161. A Dinner will be held in the Vinton Masonic Lodge following the interment. Friends and family may call at the funeral home Sunday, December 9, 2018 3:00-5:00 PM.